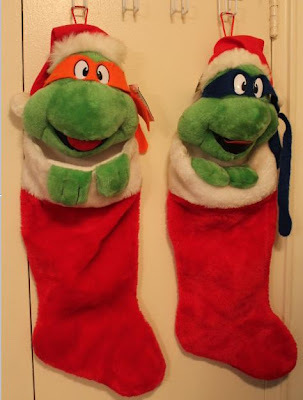 LOVE the TMNT stockings, and the Care Bear cake pan! I'm sorry that happened to you with your SSC. So many times people that have bought from me have zero feedback. I cross my fingers every time that they will follow through, and so far I have lucked out. This was the first time a ZERO feedback bidder never came through. So many eBay headaches lately. If you aren't interested in vintage TMNT stuff you should be able to sell it to someone for $30+. I've seen them before online and they looked pretty popular. This cake pan is actually different, this one stands up (3D, I guess?). I've yet to add the one you had to my cake pan collection. Oh haha you're right, why didn't I realize that?! I was getting mixed up with another photo of me and a birthday cake of a 3D Garfield. Oh & I'm gonna keep the stockings for now. I'm totally into them. You're lucky to have had fun cakes when you were little! My family got ones for $6 from Price Club. Those Pacman sheets are awesome! For really yucky stains I use a mixture of hydrogen peroxide, blue dawn dish soap and baking soda then let the item sit. It hasn't let me down yet. It's like this gigantic piece of fabric that's kinda rough like canvas (or maybe just really, really rough cotton - ha). I'll give it a shot - thanks! I'd like to link up but I don't see it in this post. Linky Tools seems to be having problems. The linkup is embedded on my blog, so when Linky Tools is back up & running properly, the linkup will be there! It seems to keep appearing & disappearing. I am in loooove with that wire basket! So adorable! Thanks! I think it had been there for a long time, the tag was extremely dirty. It's really cool. I agree that the wire basket is fantastic. Thank you for hosting. Thanks for hosting this link party, this is the first time I have linked up. You always find the best thrift items. do you still have them? and how much will you sell each?